Some of the kids sit at the beach, enjoying the summer sun after a swim in the ocean. The other was last seen (via Facebook) lounging with a friend on a ski lift. (and all with similar nocturnal visitors). I wonder if this guy travels around at night and encourages raccoons to swim in family pools. And Alice, isn't that your lawn glider? I can't wait to read Marie Winn's new book, which promises to take us on a virtual tour of NYC's greenest gem, Central Park...at night. Ms. Winn gave us an intimate look at the lives of street-wise hawks in Red Tails in Love, and now takes us into the urban evening, exposing the deep dark secretive city park. Read the review from the WSJ, an excerpt at Amazon, or attend a book event at Barnes and Noble! ...will I leave the house again without my camera. It just never fails--I always miss a photo op. Last night I took Annika to see a parish production of a musical. I sat in the car with my trusty laptop and got some writing done. As the evening grew darker, I noticed lights on in the long row of windows along the ground level of the parish school. The windows threw back-light onto two very interesting silhouettes scampering by. But I had no camera. Ah well...never again!! The second was clearly a scrawny cat, slinking along after the other shadow. That first shadow...oh, my! At first glance, out of the corner of my eye, I really thought it was a huge rat. But the behavior and movement was all wrong. For one thing, I watched as it climbed into a small yew bush, using its prehensile tail to grab a branch. Later, when the light flooded out from the opening doors, I saw the face of a fine young opossum. That would have been quite a challenge for a cat, but the cat kept its distance, and we drove away. Since I did not have my camera, I'll substitute a photo from my files. I just realized that I took this photo over 20 years ago. I wonder how many generations of opossums have some and gone since then? They are very common around here, and are most famous for their inability to cross the road successfully. 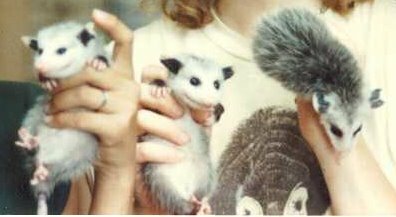 These little fellows were saved from their mother's pouch after she had an unfortunate encounter with a car, and were hand raised at the wildlife center when I was working there (along with the fourth, just out of the photo--identical quads are the norm for opossums) . Sound bizarre? This is how one might begin to write an assignment for our local school district's summer reading project. Yes, a 7th or 8th grader may, among other assignments, "Choose an astrological sign for each of the main characters and explain why the character fits the sign's criteria." There is also a list of books that "students may not [the chairperson's emphasis] read." Perhaps these forbidden books might be reserved as assigned reading during the actual school year, and thus would be unsuitable for the summer reading list. But the assignment sheet does not say that the students may not choose books from this list, which includes several classics and "Shakespeare's Works," for the summer reading project. It simply says that "students may not read" these books. Um. What if one does read them? The assignment sheet does not say, but discouraging a reader seems antithetical to the goals of the local English department, as outlined briefly in the opening line of the accompanying letter from the English Chairperson, which reads, "Educational research continually confirms the long held belief that reading provides children with many of the skills necessary for success." On second thought, the above sentence is an odd statement by itself; I always thought reading was a skill...a skill that should be nurtured and encouraged, not selectively denied. And writing is completely optional (see link above)...parents should be thankful if their child chooses to call Cathy a Capricorn, and Heathcliff a Sagittarius. At least he's writing. Trip just realized that he sat in seat 23A on his flight home from Florida. Poor Avogadro the avocado plant. Every year, I wait until the weather is warm, and move the 4 year old tree to the back yard for the summer. This year, I put it outside, and didn't notice that it really needed more soil, and probably a bigger pot. One windy evening, the tree blew over. And I forgot about it. A week or so later, wondering what had happened, I went outside in search of the tree. It was so dry that not a leaf remained green. I set the tree upright, without much hope, and added a good deal of potting soil to the pot. I watered Avogadro, and hoped for the best. The best is what happened. New sprouts, everywhere! Someone, somewhere suggested The Call to Brilliance by Resa Steindel Brown as an interesting read, and it is. It's also an aggravating read. An odd combination of education memoir mixed with a collection of the author's favorite quotes, the book would have benefited from a good strict editor. Still, it's worth reading for the inspirational story it tells, though the quotes seem perfunctory more often than not. The best part of the book is a personal story of one family's educational journey. The author explores, outlines and discusses her own education (including an anecdote from her experience at the always-amusing UC Berkeley), setting us up for the tale of her search for a real education for her children. She continues the story with detailed descriptions of how she facilitated the education of her children, often in unusual ways. She tries different schools, clearly frustrated with one-size-fits-all educational models, with innovative-sounding schools that fail to follow their own foundational theories, and with teachers who just don't get her child's unique way of learning. She tries homeschooling, and homeschooling other people's children, and in the end, settles on a sort of start-up school with a homeschooling flavor. The results are spectacular. We follow her three children from childhood to advanced university degrees and beyond, and we meet three wonderfully whole people emerging from their adventure. The frustrating parts of the book were long quotes from all sorts of sources, from educational theorists (some traditional, like Maria Montessori), self-help gurus (like Tony Robbins), and even the Dalai Lama (who will be in Aspen this weekend--Libby is hoping to catch a glimpse ;)). I tried--I really did try--to read through all the quotes and establish some kind of connection to what was happening in the narrative part of the book. I failed often, and often failed horribly. Occasionally, the quotes fit nicely; but I soon learned to recognize when a quote was interfering with the pace of the narrative, or simply going nowhere, and skipped it. In the end, what I most wanted to do was take a pair of scissors to the book, excise all of the irrelevant quotes, and paste it all back together. Certainly, it would make the book more readable, so skip the quotes and get through the very valuable story, which loses nothing without them; you can always return to the quotes later. Brown insists throughout the book that all children are brilliant, and she makes her case well. And her story of search and discovery will resound with most homeschooling parents; The Call to Brilliance is similar to the stories we each have--stories of helping our children become the people they are intended to become, despite "learning disabilities" or those insidious labels that institutional schools use to explain away differences in individuals. The specifics of Brown's story may help some families look beyond schools, beyond curriculum providers and text-books, and beyond desks and tests to find that elusive "better way" to facilitate the education of their children. It is a book which will certainly inspire every parent who reads it. And there is even some dim hope that those outside the world of homeschooling will take a closer look at alternatives to institutional education, considering the details of this story and of our own stories as we tell them, not as unusual exceptions, but as extraordinary norms. Someday, someday soon, I hope, when a child says, "I homeschool," the world will come to expect and recognize brilliance. ETA (LOL!! ): I totally ruined the spelling of the Dalai Lama's title...fixed now. How delightfully embarrassing. ;) But brilliance has nothing to do with spelling, I'm sure. Check them out...just don't be drinking anything. What's closed when it's open, and open when it's closed? Boys playing ball at sunset. And the moon rises over the east end of the beach. We dropped Trip off at Ave Maria University for two weeks of college fun geared towards high school students. It was sunny and hot--typical summer in Florida! The town is lovely, and though it is only partially built, we could see that it has potential to grow into a lovely community. We were anxious to get out of the car after a 21 hour drive. We arrived just in time for Mass (in the Extraordinary Form) at the Oratory. We helped T to move into his dorm room. Then, the skies changed...(this is the view from his room--looks a bit like a low security prison). It poured and flooded the streets. The good folks at Ave Maria town assured us that this was an unusually hard, long rain. The Oratory disappeared in the heavy downpour. Can you still see it? and other signs assuring us that some land was reserved for endangered species. As we drove in to the town, a falcon dove right in front of our car and grabbed something out of the run-off ditch. It was great! And the birds there were amazing. We saw so many different types--grackles, mockingbirds, cattle egrets, herons, vultures, ibis, cormorants, terns, osprey, and more. Last time we stopped here, Trip threw up. This time, we had dinner. SOB is best viewed at night. A Bird Hunt at the Beach! Join Us! Take a walk down the boardwalk with us, and let's see what we can find! The dunes rise on either side of us, but we pass through to the beach. We see a skimmer and its shadow. The skimmer's lower bill is longer than its upper bill! We see a family of American oyster catchers. Can you tell which is the baby? Can you find the endangered piping plover? Here's a tern chick. Take a good look! Can you see any in this photo? How about this one? They are very well camouflaged in the sand! "Remember those cute, colorful illustrations of Tootle the Train, Scuffy the Tugboat, and The Pokey Little Puppy? Well, you’ll be able to see them and other original artwork from Little Golden Books during an ongoing exhibit at New York’s Children’s Museum of Manhattan (CMOM)." I thought this was such a cool picture to share. Libby was hiking in Aspen, when a friend found an iPhone on the trail. That explains the surprise on her face. But the really cool thing in the photo is the snow! You can clearly see it melting into a small creek. I wonder what river this flows into eventually. It's hard to imagine that big rivers sometimes begin as little trickles. So, what drives a music student to climb a mountain to find where the river begins? Good books ;). Some of our favorites include Locker's Where the River Begins (of course! ), River Wild by Nancy Castaldo, and classics like On The Banks of Plum Creek, Minn of the Mississippi, and Paddle-to-the-Sea. Having read these as a young student, who could pass up an opportunity to seek the beginning of the river? 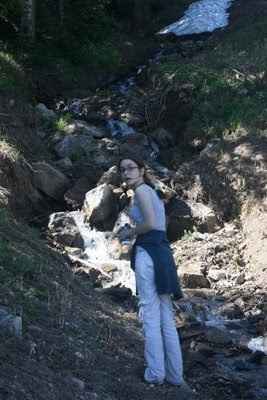 So, she convinced her friends to climb a mountain, following the local stream until it became smaller and smaller. Finally they found the source of the cold, rushing water. And they returned the iPhone to a very grateful owner! A video from Vanderbilt University. Why do I Cry When I watch this Video? Where the He-- is Matt? (2008) from Matthew Harding on Vimeo. Summer Nature Study. Like it should be. Check out the canvas field bags...too cool! The Face of Summer, with Freckles! Getting past the jargon, there are a few interesting observations, especially for those of us looking to engage our relatives who work in the government education business.